The workshops were great yesterday! Everyone seemed to enjoy the class and love my workshop! 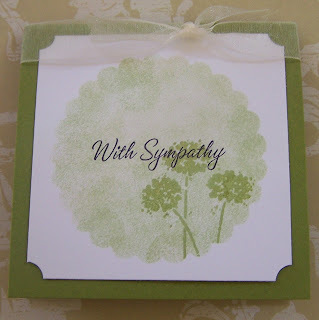 I needed a quick card for later this week so I thought I would share it with you. It is to celebrate the life of a beautiful woman who lost her battle with breast cancer after over 5 years. She will be missed dearly by her family and friends. This is a short volume but I just couldn't help myself...I have my 30 cards for $30 at 2pm so this has got to be quick!!! 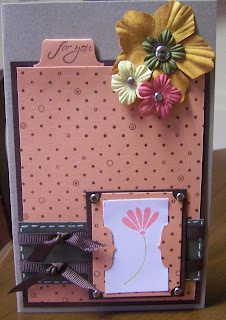 I saw the tutorial for this card on Beate's Blog and just had to try it because it's just TOO cute! 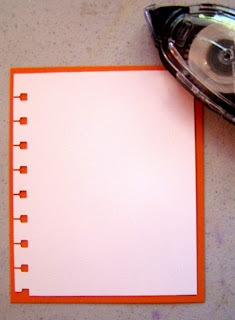 Imagine, you could use this to share a picture or a recipe...the possibilities are endless! Check it out! How cute is that?!? Thank Beate for sharing! Don't get excited! No stamp sets have retired...just my father-in-law! We went to see him in all of his glory last night (I should have taken a photo!) I did manage to get a photo of his card (I took it in the car on the way to the party! Thank you Liv for the beautiful backdrop! Well, I have to admit, this one was well worth the time...my Father-in-law was very impressed! I just love it when I get a card right! 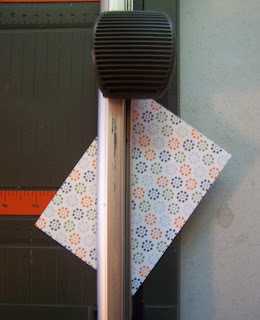 It looks like it might be time to do another tutorial...that way I can share with you how I made the medallion! Well, I went to http://www.random.org/ and asked for a number and it came up with the number 14...so, I counted and it seems that Latisha is our big winner! Thank you so much for all of the attention! You have all made me a very happy stamper!!! I especially love that some of you are coming back to see what I have been getting into! 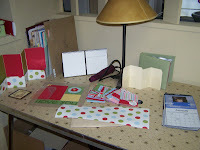 I hate to put up a post and not have a photo to share...so I thought I would take some photos of my workshop to share. 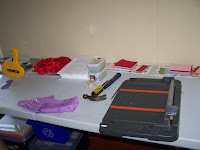 I believe this is the cleanest this it has been (DH is in the middle of doing some work so there are some tools on one of my tables)...I don't usually use that type of hammer on my cards!!! We are still working on the room and will be for the next several months but for now this will do. Anyway, I must get back to preparing for this weekend's workshop! The next thing I knew I spied DH's empty coffee can in the recycling (the large tin)...I don't know what came over me but it spoke to me! So, here is Buttercup's challenge! 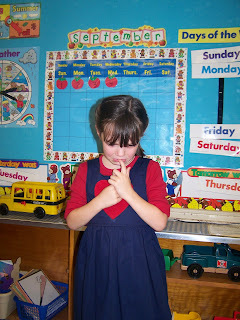 She choose the papers, stamps and embellishments (even the ink colour)...we had a great time! Buttercup can't wait for her day to show her treasure box!!! Cut second piece of paper into a 5" circle (I used a Fiskars circle cutter) and glue to the centre of the lid to cover the writing. Decorate your lid as desired. 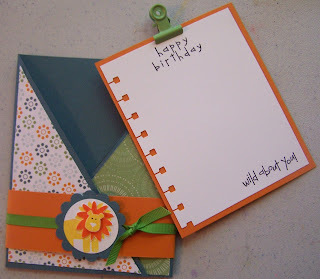 Buttercup loved stamping her name and glueing it all together...poor girl was worried about not centering the paper. Stop right there mom! 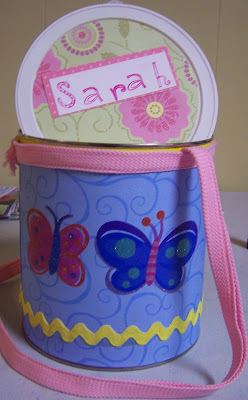 This is not your project...but if it was, I would fill it with something fun...I will share some ideas with you later on (after Buttercup's special day) but for now it's filled with some of her small dolls to share with her friends at school. Find the right support group...because at this rate I am going to be doing homework soon!!! 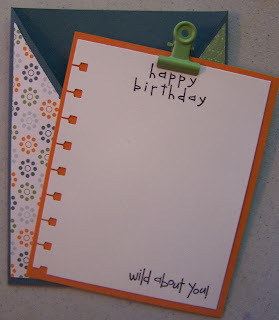 A Bloggin' Gift for a Lucky Guest! It's been busy here lately! 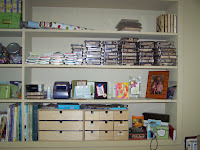 I spent the day with a HUGE crowd of Stampin' Up! Demonstrators at our Regional Meeting in Hamilton! This gave us the opportunity to swap, mingle and learn some great new ideas and techniques to share! I was very excited to meet Vicky a fellow blogger in person! I have to admit, I felt a bit like I was meeting a celebrity! Such fun! This was one of my favourite Make & Takes...the really cool part is that it has a cute little pocket inside...but we will save that for another day! 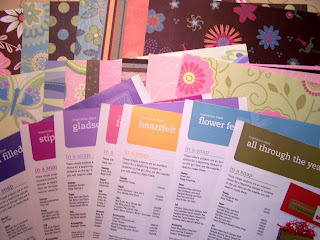 I am usually an exclusive Stampin' Up Girl but when I saw the BIG box of K & Company Papers at my local Costco, I just couldn't resist the urge! 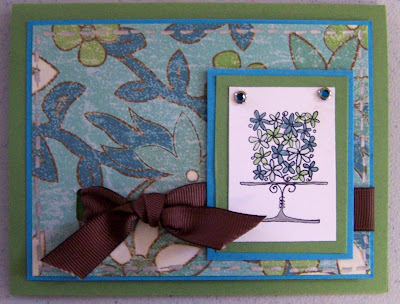 So, here's the scoop... first of all, this is a CASE from Sharon Johnson over at No Time to Stamp...go check it out...she's got simplicity down pat! I think the best part is the actual gift (I am giving her my "Girlfriends' Card Kit") which I hope she is going love! I told you I had been busy...I created this last night too but just didn't get to posting it. I decided to use a sketch from Pencil Lines for inspiration and came up with this using Sketch #49. 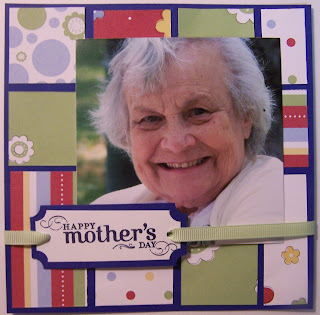 This wasn't the picture I was originally intending on using, in fact Granny is covering some of my embellishments but I hate to show Scrapbooking without photos...I want you to see how the pages look with photos in them. Now imagine your photo there! All of your responses have been quite motivating to me! I just love the attention (who doesn't?) 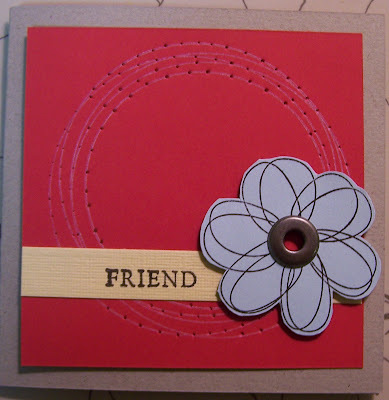 So, as a result, I have spent my evening stamping (well, creating really...)! You see I forgot to tell you, Mr Brown appeared at my doorstep this afternoon! 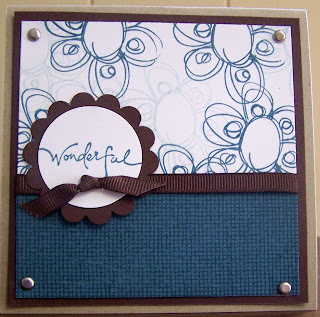 So rather than share with you the actual products he brought, I thought I would share one of my creations instead (this was CASEd directly from the Stampin Up wrapper)! So here it is...I know I have used this photo before but what can I say...there is nothing like a Mother's love! Anyway, this is another page for my upcoming calendar class on November 4th. Register now, space is limited! It's as simple as that! Ready to buy the kit yet? I am so, so, so excited! As part of my celebration I have added the Feedblitz Application. This means that you can have any posts I do e-mailed to you at the end of each day! So go ahead, what are you waiting for? Sign up! Thank Blog for my Readers! Well, I am very impressed! 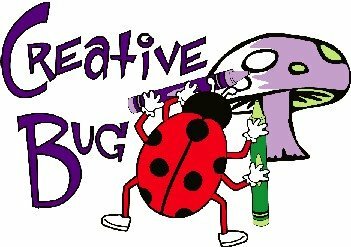 I really only launched the Creative Bug Blog a few months ago and am so pleased to see that I am up to over 1,000 hits! 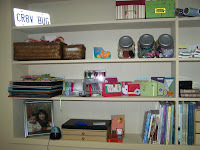 I know that's small time for some great bloggers out there but we all have to start somewhere! So, I am delighted to announce that I am going to have some great blog candy for one lucky, lucky participant! 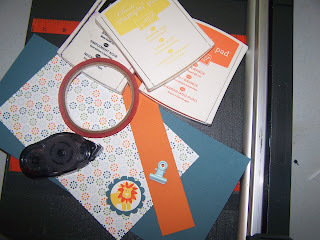 It is not finalized yet but there are for sure going to be some great papers from K & Company, accompanied by some Stampin Up! Inspiration Sheets. 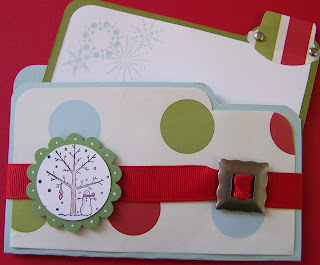 I would like to add some Card Candy to this (fun embellishments created by moi!) but we will see if time permits! Now, in return for this fun opportunity, I would ask that you, (my beloved readers! ), leave me a comment and tell me your favourite post so far or something you would like to see in an upcoming post. I will randomly draw a number next Tuesday afternoon so be sure to post by the end of the day Monday or early Tuesday morning! 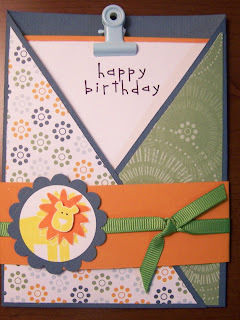 Score 5 1/2" x 12" piece of cardstock at 3 7/8" and 8 1/8"
Glue patterned paper to the card front. 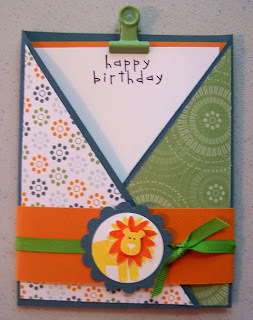 I used doubled sided patterned paper and used a piece from either side. 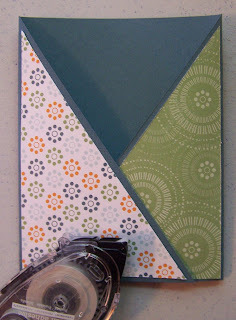 Add sticky strip to the bottom of the middle panel, as well as the bottom of the triangle flap that will be on top of the card. 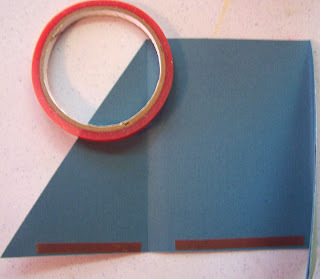 Tape the card base together and set aside. 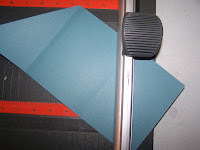 Score 1 1/2" x 9 1/4" piece of coloured cardstock at 2 1/2" and 6 3/4". 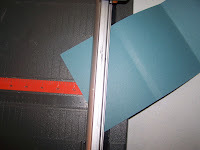 Use sticky strip on one end to tape band together. 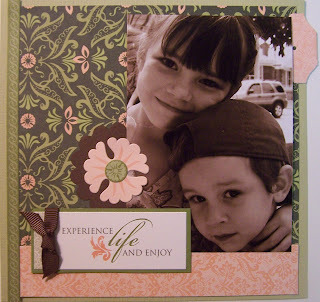 Embellish your band and add to your card base. Le Voila! The card is complete and ready for mailing! 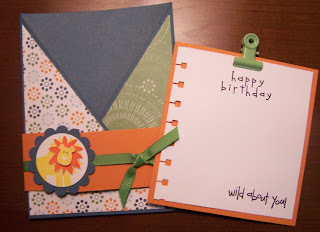 Wild About Criss Cross Cards! 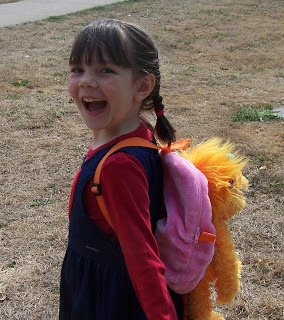 Buttercup's First Day of School! 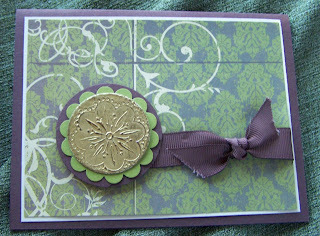 Onto stamping now...I figured I would lump a couple of challenges together today...so we have a sketch challenge and a colour challenge...it took me quite awhile but I am happy with the results in the end...I think! What do YOU think? I hope they enjoy this card! And I will be sure to post our new harvest table that they created just for us when it's at home in my kitchen!!! Now who doesn't LOVE a SALE??? 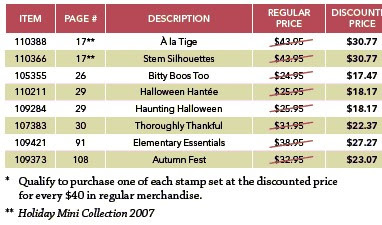 So here we go...if you spend $40 you can recieve any of the listed stamps at 30% off!!! I will be placing orders on September 6th and the 20th so take a look and let me know! If you do not have a catalogue please contact me or check it out on-line. 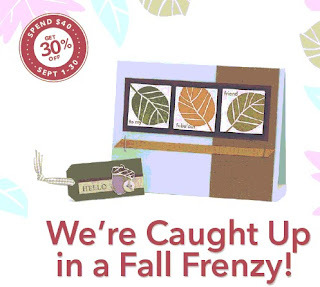 You have until September 30th to take advantage of this great deal!! !